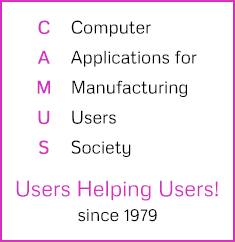 CAMUS is the international Users Group for the MANMAN, MK, and MAXCIM ERP software on HP3000, VMS, UNIX, and Intel platforms. Formed in 1985, CAMUS has given users a unique opportunity to interact, learn, and share information and experiences, and to make valuable connections. Membership is free and is open, not only to companies that use MANMAN, MK, or MAXCIM, but also to companies that offer products and services to users. CAMUS offers these associate members a number of opportunities to promote their products and services. First I’d like to thank any and all that have answered so many of my questions over the past 10 years (can’t believe a decade has passed since… started this job!). This has been a great experience.